Many people I have met have expressed concern about the homeless problem in our country but resign themselves to inaction because they feel that there is nothing they can do about it. They could not be more wrong. There is plenty that one person can do to help. Years ago my family began a tradition during the Christmas holidays that involved wrapping gifts of gloves and hats to give out to the homeless people we met while walking in downtown Omaha. One experience stands out in my mind during one of our trips downtown. We approached an old man who had obviously been dumpster diving for food recently. After giving him his gift which he expressed much gratitude for, I asked him when was the last time he ate. He responded with a large toothless grin and held up his large garbage bag full of bread and donuts. “No”, I said. “When was the last time you had a real meal?” He held his head down and sadly said, “Maybe 3 or 4 days.” I then told him, “Let’s go get some junk food.” And walked him to a nearby Burger King with my two children in tow. The man kept insisting that he only wanted a cup of coffee but me and my children sat him at a booth and returned with a cheeseburger, fries, and a cup of coffee. While he was eating his meal I noticed tears falling down this man’s cheeks. I asked him what was wrong and his answer astounded me. “No one has ever treated me this good.” he said. To this day I can’t remember that man’s name and I have never seen him again but it took 15 minutes of my time and a couple dollars to make this man’s year. Sometimes that’s all it takes to help out a homeless person. Sometimes just a smile to a person who has been made to feel invisible to the rest of the world. 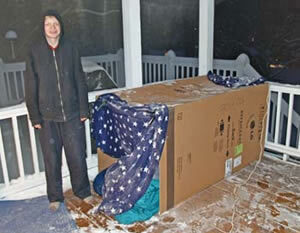 Below is an example of what one young man did to help the homeless in his community. I hope he inspires others who read his story to do the same. Peter Larson, 15, brushes his teeth, tugs a hat over his ears and hugs his mom good night before walking out of his family’s cozy home and climbing into a cardboard box on his back porch in Plymouth, Minn. (pop. 65,894). On the first night of Peter’s 40-night “sleep out” that ends Dec. 23, the temperature is expected to drop into the lower 20s—a forecast that makes the lanky teenager smile. Every November and December since he was a first-grader, Peter has camped out for a cause—experiencing what it’s like to sleep in Minnesota’s frigid air while raising money to help homeless people stay warm in affordable housing in the Minneapolis suburbs. Peter developed a heart for the homeless at a young age. He was 6 when his father, Bruce Larson, organized a one-night campout for his Cub Scout pack at a local park as part of the Sleep Out Campaign organized each fall by Interfaith Outreach & Community Partners (IOCP), a nonprofit organization based in Wayzata, Minn., that serves low-income families. Peter slept in a tent and collected canned goods to donate. As part of the experience, Peter’s father recruited the Sleep Out Campaign’s founder, Bob Fisher, to speak to his scouts. Fisher also told the youngsters that, for every $500 raised, IOCP could provide one family with housing assistance. The next year, after his Cub Scout pack slept in boxes for a single night, Peter asked his parents if he could continue camping in his yard on weekend nights and try to raise $500. Peter went before his congregation at Messiah United Methodist Church and asked for support, setting up a table outside the sanctuary to take donations. He raised $1,000, enough to assist two families. Now a sophomore at Wayzata High School and in his 10th year of helping the homeless, Peter has braved more than 250 cold nights in a cardboard box, and he has raised about $185,000 to help families struggling to pay the rent amid job losses, wage cuts and decreased work hours. In addition to contributions from church members, two local restaurants donate part of a day’s profits while Peter waits on tables and shares his story with anyone who will listen. As part of Peter’s education on homelessness, he’s spoken with social workers about how housing is the cornerstone of family stability, toured homes built for safety and affordability and, last year, met several families who have benefitted from his selflessness. Before meeting Abdulahi and her three oldest daughters, ages 8 to 11, Peter couldn’t put a face on the people he was helping. Now he can. “They’re just normal people who needed a little help,” he says. Camping in the cold has not been without its adventures. In the early years, Peter spent hours designing and building his corrugated home—sometimes connecting two boxes and adding a night-light so that he could read before going to sleep. His family’s Schitzu poodle, Teddy, slept with him, but Teddy’s company was short-lived. “He kept going to the bathroom on my sleeping bag so we had to put him back in the house,” Peter says. Last year, the temperature dropped to 20 degrees below zero on several nights, and Kohler urged Peter to skip those days. 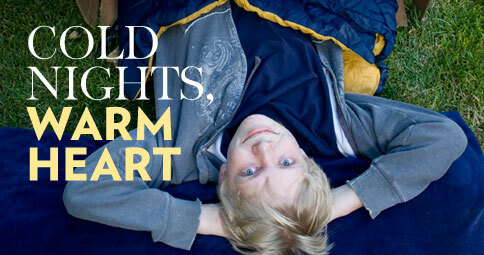 “Peter didn’t see an issue, and he slept outside anyway,” his mother says. His mentor isn’t surprised with Peter’s dedication. “He’s has never once said, ‘Gee, I don’t know. This is too hard,'” says Fisher, 61. 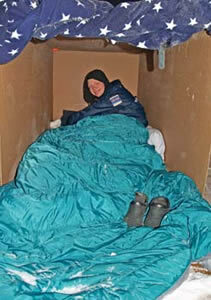 This year, Peter is sleeping in a cardboard box that measures 8 feet long by 4 feet wide and has a 4-foot ceiling. A blue tarp on top protects against rain and snow and, on especially cold nights, Peter slides into a blue and yellow sleeping bag made by his Grandma Larson. The accommodations are not as cozy as the twin bed in his upstairs bedroom, but they suit Peter just fine. “He actually sleeps better outside, and I think he wakes up happier,” says Joni, who on some mornings must shake the box to wake her son. Peter’s goal this year is his most ambitious yet—to raise $100,000, enough to provide 50 families with a warm place to sleep. Additional Information: To support Peter’s cause, visit https://iocp.ejoinme.org/Peter_Larson.